I have a confession to make. I’ve only watched a handful of Doctor Who episodes in my life and I don’t even remember which doctor it was. Watching was a bit of an accident as well. I really liked the show that came on before and there were times where I was too lazy to turn off the TV and go to bed. Yes. I’m a Red Dwarfer. 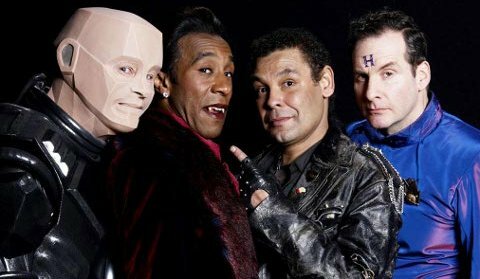 I’ve watched all the seasons and even follow Robert Llewellyn, the guy who played Kryten the mechanoid, on Twitter. Turns out he really likes hybrid and electric cars, who knew? I will be a very happy camper when the mysterious season 11, that has been rumored to be in production, is available in the US. It seems that I can’t call myself a speculative fiction writer without having a working knowledge of the good Doctor. That means I have some catching up to do and will need some advice. It’s time to come out from the rock I’ve been hiding under. First – is there a season I should start at, or is it recommended to start at the beginning? Second – is there a preferred snack that pairs well with a marathon session? Help me out, this is the Doctor I remember. What number is he? This entry was posted in TV Talk and tagged catching up, Dr. Who, Kryten, Red Dwarf, Robert Llewellyn, The Doctor, Tom Baker by Jodi. Bookmark the permalink. Oh dear. We need to fix this situation promptly. DW went off the air sometime in the 90s and was revived nearly 10 years ago with higher production values and new producers, The concept basically continued in that the new actor playing the Doctor, Christopher Eccleston, was referred to The Ninth Doctor (meaning eight other actors played the Doctor throughout the earlier era). However, the 2005 revival is called Series One. As in, you can jump in right here and you’ll be fine, because it’s an all-new story based on an existing concept. This is strictly my opinion. Series one is OK, but I don’t think it’s all that great. Other people consider it the best. 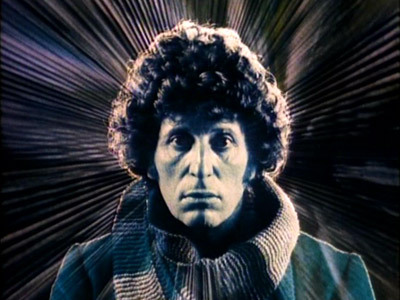 Although Doctor Who has always been loopy, the stories bordered on being childish. However, about 2/3 of the way through Series One, an episode called “The Empty Child” aired, and it was an instant science fiction classic. If you are seriously interested in getting in on DW (and why wouldn’t you be), you can start with Series One, be patient through the early episodes, and then be ready when the series starts to click. Again, some claim Series One has never been topped. I disagree strongly. In Series Two, Eccleston was replaced by David Tennant, who many consider the definitive Doctor. He’s much more charming and human (though I find his era a bit sappy and overly emotional sometimes). Series Two also starts out slow with some mediocre episodes, but it really takes off with what is widely considered one of the best DW episodes ever filmed, “The Girl in the Fireplace.” I think Series Two is better than One and plenty good for jumping in, but there are a few pretty weak stories. If you aren’t ready to commit to all seven series (13 episodes each) but really want to give DW a shot, I suggest starting with series 3, which is my favorite. David Tennant owns the role, the stories are much stronger, and his new human companion Martha, is smokin’, though I don’t suppose that last bit matters much to you. Outside of one two-episode story, the rest is a great mix of action and humor. “Smith and Jones” (the first episode of Series Three) would be my suggestion as a starting point. I know, I’m almost ashamed to admit my lack of Whovianness. [hangs head] Thanks for the detailed walkthrough of the latest series, that’s a huge help. I think I will start at series one and work through the list in order. If all goes well then I see several DW related posts in the future. And I will be standing by to leave comments, whether you want them or not! Gotcha – piece by piece I’ll get them all figured out. Hubby’s in as well, at least for now. I am a die-hard Whovian. I started watching 30 years ago. However I agree with Eric. If you are new to DW start with the new ones. I enjoyed Eccleston and there are things explained in his season that show up later. I would start at the beginning of the new ones. Excellent – two votes for starting at the start of series one. I haven’t had something interesting to watch for ages so I’m excited. Good points about story elements that show up later. Plus, Captain Jack Harkness. You don’t want to miss that character’s debut!